In Under The Influence, The A.V. Club asks a musician to pair three of their songs with a non-musical influence. 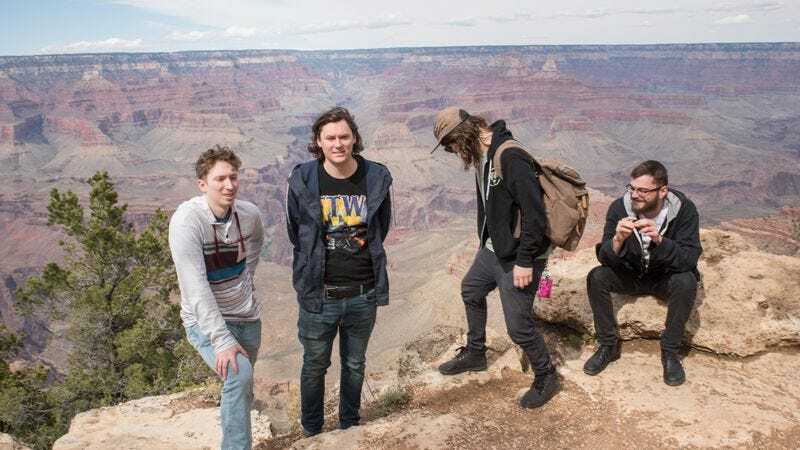 Though New Jersey-based band The Front Bottoms are often referred to as “folk punk,” the term is an insufficient placeholder for a sound that music journalists and audiences alike can’t comfortably categorize. (Singer Brian Sella has said he prefers to call it fun music, if it must be called anything.) With the 2015 release of their third studio LP, Back On Top, this indefinable quality has continued its steady maturation, with the confidence to eschew jangling crises for a quieter set of contemplations: “I’m always focusing in on the wrong things and then the wrong things become everything,” for example, or, “Whatever I did for you last year, I cannot do again.” Nearly a decade into their career, The Front Bottoms played Coachella for the first time this year, with several more stops on the festival circuit slated for this summer. For Under The Influence, Sella chose to focus on Back On Top, unpacking the wealth of personal anecdotes that inspired and informed the record. Brian Sella: I think motorcycles in general are kind of a theme on this album because it represented something for me at the age that I am right now. I’m not 21 or 22 anymore. I’m 27—not that I’m a grownup or anything. But it sort of felt like, at this point in my life, I have to start getting organized a little bit, and that led me to buying a motorcycle. I don’t really know why. But I bought a motorcycle. It was during the writing process. I’ve sold it, too, at this point. I was going through an intense time, trying to create this artistic project. We were changing labels and I was still living wherever I could at that point. So I had bought this motorcycle. Everybody had told me, “Don’t buy a motorcycle. It’s so stupid.” And I live in New Jersey. It’s not like there’s big open roads or anything. It’s all potholes and traffic. I took a camping trip up to High Point State Park in New Jersey. My friend has a motorcycle, too, so we were like, “Why don’t we? We’ll take the motorcycles up, it’ll be a fun weekend.” My girlfriend came up and his girlfriend came. It was a nice adventure. And then, on the way home, since my girlfriend had driven up in her car, I said I’d follow her back home. Right before we get to the New York City area, where the traffic is crazy on the turnpike and Route 3, she’s following the GPS, so she starts taking these side roads by Secaucus, which are just as insane. I’m flying. One of the lights turns yellow. She speeds up, but then realizes I’m following her and brakes. I didn’t have the reaction time, and I smashed into the back of her car. And I went forward and I went through the back windshield. I had a helmet on, so I was fine, but I was in her back seat. I should have been trying to find a place to live or buying a car. But then I bought this motorcycle and went through the back of the windshield. I sold it to this kid on Craigslist who was sort of in the same place as me. He didn’t know how to ride it or anything when he bought it. I saw him a couple weeks ago and he said that he had just parked it behind this alleyway behind his house and he hasn’t touched it since. BS: There’s a line in this song—I would call it the post-chorus: “Ladies and gentlemen, the DJ just threw up on the dance floor.” My good friend, [drummer] Mat [Uychich]’s brother, his name is Brian as well. He used to be in the band eight or nine years ago. He got into DJing. He would go on Craigslist and he would say, “I’ll DJ your party. Any type of party you want, I’ll DJ it.” And he’s a pretty wild guy, so he would go and he would get the party started. He would have a good time, and people would always really like him and have a good time. It’d be a bunch of little kids and then my buddy, just partying real hard. One time he got this gig at a Sweet 16, and nobody was dancing to the music. There was a bar at this thing, he gets hammered, and he’s going out onto the dance floor and trying to get all these 16-year-old kids to dance. He’s got the music pumping. I think he danced too hard. And he just puked all over the dance floor, in front of the family at this girl’s Sweet 16. And the mom comes up and says, “You have to leave. Please pack all your stuff up and go home.” I think he still got paid half or something. But he’s such a wild guy. AVC: That is an unfortunate lyric to have been directly inspired by real life. BS: He didn’t even care, though! He’s all about having a good time. That definitely sums up at least a certain section of my life and how “I must have liked it a couple years ago, but at some point I changed my mind.” It’s the idea of getting older. That’s a line in “Motorcycle”: “We’re older now.” It’s all in the “living life” theme, but that’s where that line came from. This kid throwing up at this birthday party—it’s pretty hilarious. BS: West Virginia’s an interesting place in general. I have a lot of memories from West Virginia, and it was always very good for us. For some reason, even when we’d go to other places and nobody would show up, we would go to West Virginia and there’d be a couple hundred people there on a Sunday night, which was kind of weird. One time the vibes were so good on stage that I said, “I promise I’m going to make a reference to West Virginia on the next album.” Everybody went nuts. And then we had this awesome little intro part, and it just made perfect sense. It fell into place: “This is for all my friends in West Virginia.” There’s a river called Mud River in West Virginia, by one of these random places we would play. That’s really stayed with me. I don’t really know why. “Mud River”—I thought that was an interesting visual. That kind of shined through for [the 2013 single] “Twin Size Mattress”: “When the flood waters come, it’s not going to be clear, it’s going to look like mud.” That was back in the day when we would be asking for places to stay onstage during the set. Everything just seemed to work out in West Virginia. AVC: The song seems laced with a little melancholy and regret, so it’s surprising that it came from these tender roots. You just felt good about this place and wanted to make that known. BS: We were thinking of doing it all acoustic, and then when that big “love of my life” part comes, just stomps and claps, it changed a lot. The song changed a lot from beginning to end. There’s definitely some aggression there. But again, that has a lot to do with just growing up, getting a little older, thinking about the direction you’re going, really hoping and hoping with all your might that you’re doing the right thing, that you’re going in the right direction. AVC: I’m your age, so to hear this 27-year-old album about 27-year-old things is to feel all of those same things in the moment I’m listening. I’m lucky enough to have that particular relationship to the album. BS: That makes me so happy to hear you say that, because it’s something that’s been very, very important to us as a band—to just develop naturally and not really force anything. I’m 27, Mat’s 25. Let’s make an album. Let’s talk about what’s going on in our lives, and let’s not try to make “The Beers” again, because I was 20 years old when I wrote that song. We can play that live and we can have fun and mess around, but there’s definitely bands that I’ve formed a connection with in my life, and the ones that have stayed with me are the ones that have developed. But if you were maybe 13 when that first album came out and now you’re 21, and you’ve managed to grow and develop parallel with the band, maybe at different moments of your life, each one is like a placeholder. That’s important to us, to develop and to refresh. AVC: The lyrics in “Help”—“I’m always focusing on the wrong things, the wrong things become everything”—are going to be relevant to that 13-year-old, if not now, definitely soon. And they’ll be treated to that sudden moment of realization. BS: Absolutely. I mean, I hope so. You can only hope. But it does feel very positive. So far so good, as they say.